"With a level of detail that is chilling to the bone, Beorn demonstrates that during the first phase of the war with the Soviet Union, a time when Germans were euphoric about their results on the front, every single Wehrmacht unit in Belarus contained a core group of men who could be counted on to murder Jews. 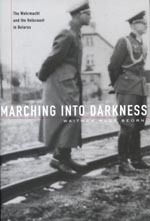 Marching into Darkness convincingly shows how and why these atrocities could occur. A major contribution."